No sexual dimorphism in this group. Sexual dimorphic 2nd gnathopods in Male of this group. - Morino, H. , 1991. Amphipoda. In: Aoki, J. (ed. ) Pictoral Keys to Soil Animal of Japan. Tokai University Press., pp.65-66, figs. 213-219. - Morino, H. , 1999. Amphipoda. In: Aoki, J. (ed. ) 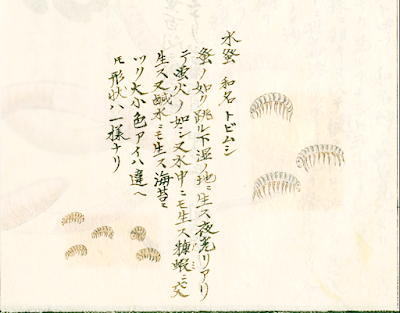 Pictorial Keys to Soil Animals of Japan. Tokai University Press., pp.626-644. - Morino, H. , 2015. Amphipoda. In: Aoki, J. (ed. ) Pictorial Keys to Soil Animals of Japan. 2nd edition. Tokai University Press., pp.1069-1089, figs. 1-11. Japanese natural history illustrator drew in 1811 original picture of this talitridean amphipod. - 朝井俊亘・細谷和海 2012. ちりめんじゃこを用いた透明骨格標本の作製. 近畿大学農学部紀要, 45: 135-142. - Bousfield, E.L. 1982. 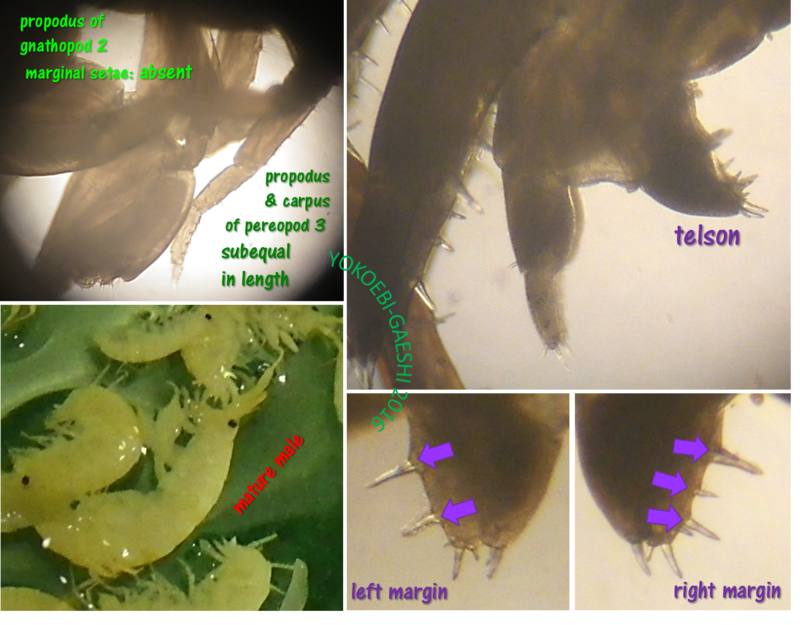 The amphipod superfamily Talitroidea in the northeastern Pacific region. 1. Family Talitridae; systematics and distributional ecology. National Museum of Canada, Publications in Biological Oceanography, 11: i–vii, 1-72. - Chapman, J.W. Gammaridea. In: Carlton,J.T. (ed.) The Light and Smith Manual Intertidal Invertebrates from Central California to Oregon. Fourth Edition, Universally California Press, pp.545-618. - Coleman, C.O., 2005. Speeding up scientific illustrations. 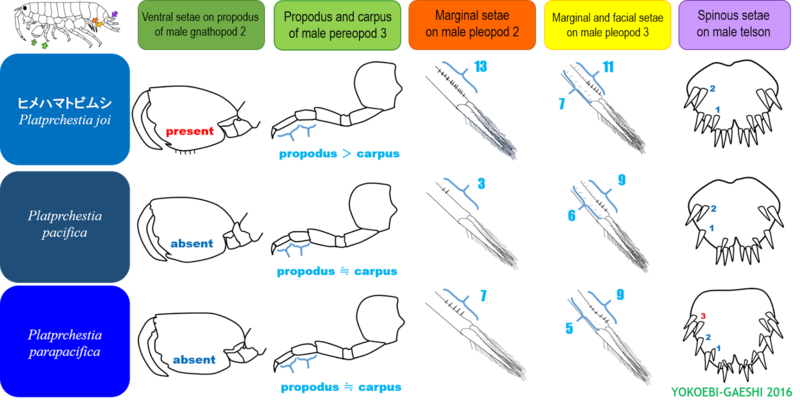 A method to avoid time consuming pencil drawingsparticularly in arthropods. NDLTD Union Catalog. - 星出兵馬 1956. Amphipodaに寄生する有頭簇虫について (第26回日本動物學會大會発表). 動物學雜誌, 65(3,4): 151. - 飯島明子(国際湿地保全連合) (ed.) 2007. 第7回自然環境保全基礎調査 浅海域生態系調査（干潟調査）報告書. 環境省自然環境局 生物多様性センター. - Iwasa, M. 1939. Japanese Talitridae. Journal of The Faculty of Science Hokkaido Imperial University, Series VI. 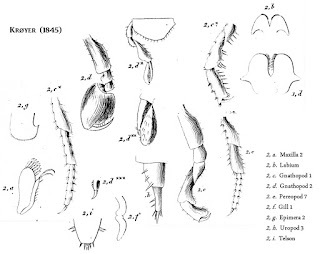 Zoology, 6(4): Plates IX-XXII, 255-296. - Jo, Y.W. 1988. 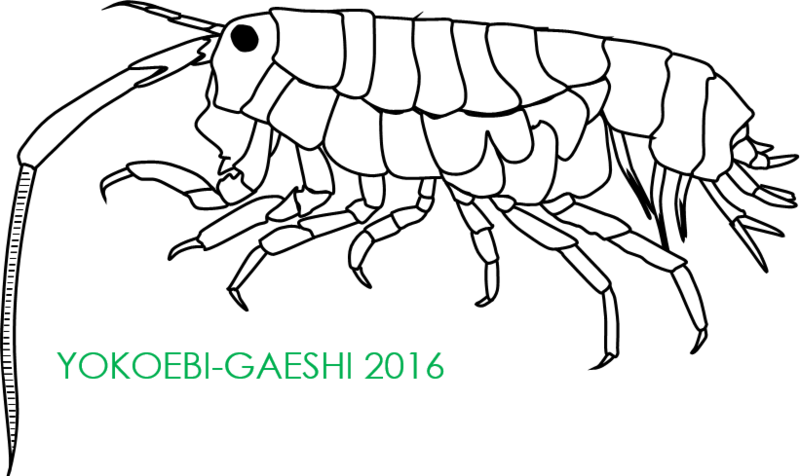 Talitridae (Crustacea - Amphipoda) of the Korean coasts. Beaufortia, 38(7)： 153-179. - Kato, M. 1995. The aspidistra and the amphipod. Nature, 377: 293. ; doi:10.1038/377293a0. - Kim, M.-S., J.-H. Jung, and G.-S. Min 2013. A new beach-hopper, Platorchestia parapacifica n. sp. (Amphipoda: Talitridae), from South Korea, with molecular phylogeny of the genus Platorchestia. Journal of Crustacean Biology, 33(6): 828-842. - Krøyer, H. 1845. Karcinologiske bidrag, Fortsøttelse. Naturhistorisk Tidsskrift, 2(1): 283-345, 403, 453-638. - 栗本丹洲 1811. 水蚤. In: 『千蟲譜』. (duplicated by 服部雪齋) 巻ノ3, p.27. - Lowry, J.K. and C.O. Coleman 2011. Africorchestia a new genus of sand-hoppers (Crustacea: Amphipoda: Talitridae) from western Africa and south-western Europe. Zootaxa, 2825: 55–68. - Lowry, J.K. and C.O. Coleman 2012. A new terrestrial talitrid genus from the Philippine Islands (Crustacea, Amphipoda, Talitrida, Talitridae) and the designation of two informal subgroups. 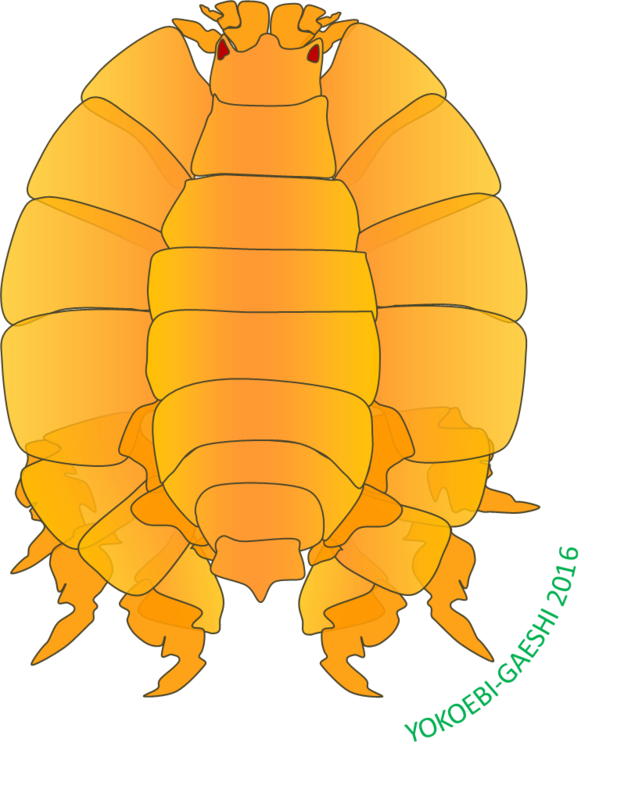 Zootaxa, 3400: 64–68. - Lowry, J.K. and A.A. Myers 2013. A Phylogeny and Classification of the Senticaudata subord. nov. (Crustacea: Amphipoda). 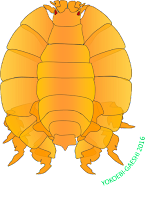 Zootaxa, 3610(1): 1-80. - Miyamoto, H., H. Morino 2004. 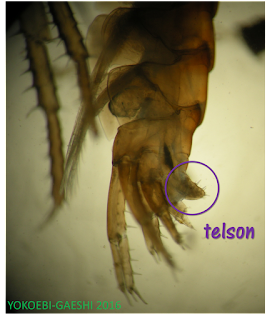 Taxonomic studies on theTalitridae (Crustacea, Amphipoda) fromTaiwan, II. The genus Platorchestia. Publications of the Seto Marine Biological Laboratory, 40: 67–96. - Morino, H. 1975. 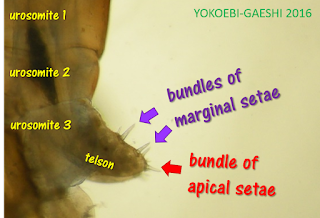 Studies on the Talitridae (Amphipoda, Crustacea) in Japan II.taxonomy of sea-shore Orchestia with notes on the habitats of Japanese sea-shore talitrids. Publications of the Seto Marine Biological Laboratory, 22(1-4): 171-193. - Morino, H. 2014a. 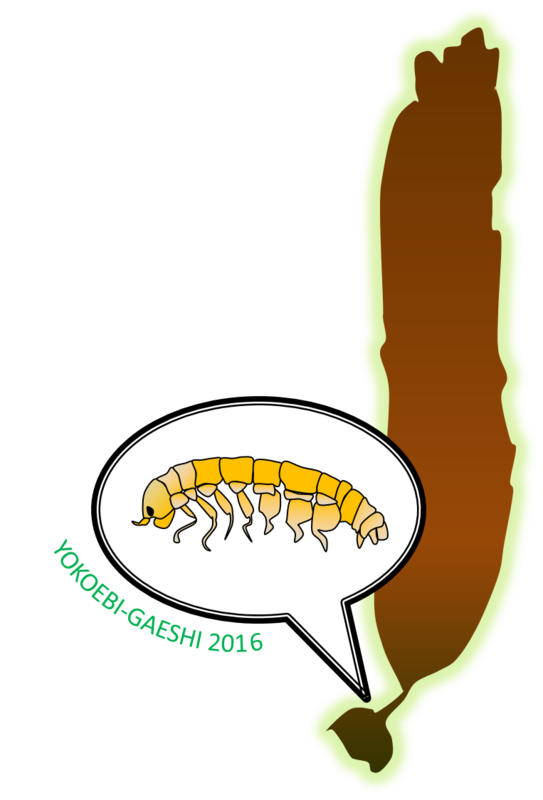 A New Land-hopper Genus, Mizuhorchestia, from Japan (Crustacea, Amphipoda, Talitridae). Bulletin of the National Museum of Nature and Science, A, 40(3): 117–127. - Morino, H. 2014b. 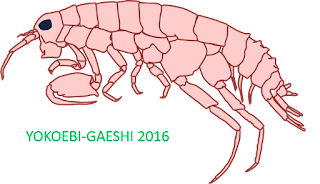 A new Land-hopper species of Bousfieldia Chou and Lee, 1996, from Okinawa, Japan (Crustacea, Amphipoda, Talitridae). Bulletin of the National Museum of Nature and Science, Series A, Zoology, 40(4):201-205. - Morino,H. and H. Miyamoto 2015a. A new Land-hopper Genus, Nipponorchestia, with Two new species from Japan (Crustacea,Amphipoda, Talitridae). Bulletin of the National Museum of Nature and Science, Series A, Zoology, 41(1): 1-13. - Morino,H. and H. Miyamoto 2015b. 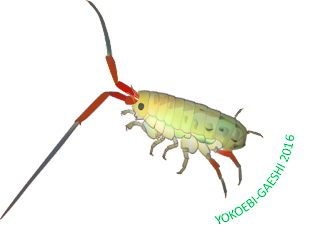 Redefinition of Paciforchestia Bousfield, 1982 and description of Pyatakovestia gen. nov. (Crustacea, Amphipoda,Talitridae). Bulletin of the National Museum of Natural Sciences, Ser.A 41: 105-121. - Morino, H., H. Miyamoto 2015c. Description of a New Land-hopper Genus, Kokuborchestia gen. nov. and Redescription of K. kokuboi (Uéno, 1929) comb. nov. (Crustacea, Amphipoda, Talitridae). Bulletin of the National Museum of Natural Sciences, Ser.A, 41(3): 155–162. - Morino, H., H. Miyamoto 2015d. Description of a New Talitrid Genus Ditmorchestia with Redescription of D. ditmari (Derzhavin, 1923) comb. nov. (Crustacea, Amphipoda, Talitridae). Bulletin of the National Museum of Natural Sciences, Ser.A, 41(4): 217–224. - Morino, H., H. Miyamoto 2016a. Description of a New Talitrid Genus, Ezotinorchestia with a Redescription of E. solifuga (Iwasa, 1939) comb. nov. (Crustacea: Amphipoda: Talitridae). Species Diversity, 21: 65–70. - Morino, H., H. Miyamoto 2016b. 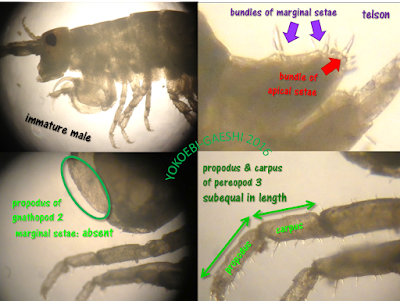 A New Talitrid Genus and Species, Lowryella wadai, from Estuarine Reed Marshes of Western Japan (Crustacea: Amphipoda: Talitridae). Species Diversity, 21(2): 143‐149. - 永田樹三 1965. 端脚目 (AMPHIPODA) 概説. In: 岡田要 (ed.) 『新日本動物圖鑑』. 北隆館, 東京. - 日本動物研究学会 (ed.) 1934. ハマトビムシ. p.566. 『全動物圖鑑』. 泰明堂, 東京. - 笹子由希夫 2011.日本産ハマトビムシ科端脚類の分布と分子系統解析. 修士論文. 三重大学. - Serejo, C.S., J.K. Lowry, 2008. 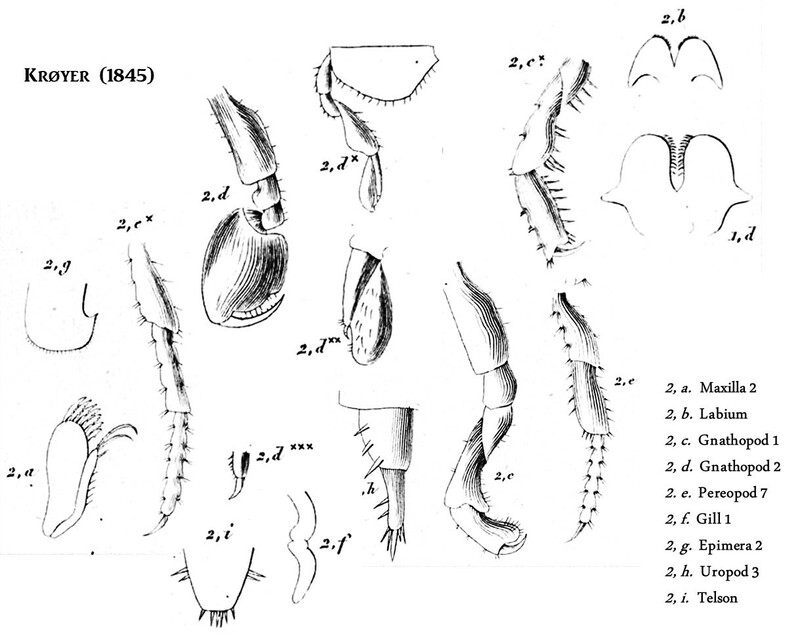 The Coastal Talitridae (Amphipoda: Talitroidea) of Southern and Western Australia, with Comments on Platorchestia platensis (Krøyer, 1845). Records of the Australian Museum, 60(2): 161–206. - Stock, J.H., C.K. Biernbaum 1994. Terrestrial Amphipoda (Talitridae) from Ascension and Saint Helena (South Central Atlantic). Journal of Natural History, 28: 795-811. - White, K.N., J.K. Lowry and Morino, H. 2013. A new cave-dwelling talitrid genus and species from Japan (Crustacea: Amphipoda: Talitridae). Zootaxa, 3682 (2): 240–248.